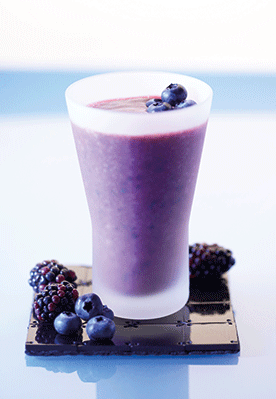 This is a rich mix of delicious antioxidants that will leave you and your skin feeling good. 1. Remove any stalks from the blackberries and currants and pick over the fruits, discarding any that look a little mouldy. Reserve a couple of juicy-looking berries to garnish. 2. Peel the banana, break it into chunks and add them to the blender with the other fruits. 3. Blitz the fruits until smooth, then pulse in the apple juice to combine. 4. Pour into a glass and serve scattered with the reserved berries.